It levels up from the usual rom-com fare and logs into the world of augmented reality gaming. It's so gripping you can't help but keep going. Hold on, K-drama fans, this is going to get a little confusing. A young man makes a frantic phone call in the middle of the night to Yoo Jin Woo (Hyun Bin), the CEO of an investment company, telling the wealthy investor that he wants to sell him a gaming program he created. He proposes they meet at Hostel Bonita in Alhambra, Spain. Before Yoo Jin Woo can ask any questions, the young man drops the phone and runs away from an unseen assailant. At first, Jin Woo isn't interested, but because his former BFF turned business rival (not to mention the guy who ran off with his ex-wife) is, his competitive streak kicks in. He has to have the gaming program. 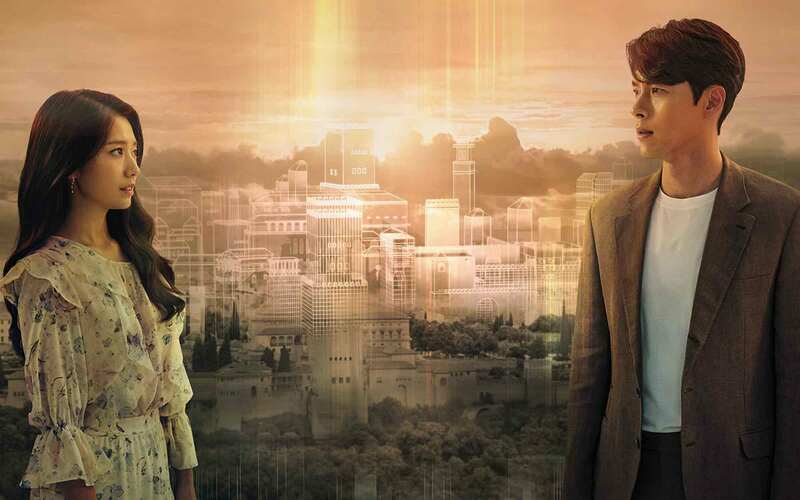 He makes his way to Alhambra and checks in at the hostel, which is run by Jung Hee Joo (Park Shin Hye), a down-on-her-luck classical guitarist working several jobs to make ends meet. Jin Woo is less than charming on their first meeting and makes an abysmal impression. Meanwhile Se Joo doesn't make it to the hostel, and seems to have vanished without a trace. Jin Woo decides to test the AR (augmented reality) game anyway, using the smart contact lens his company has developed to run it. It turns out Se Joo is a genius and the game he has created exceeds expectations. Pokemon Go, this is not. The seamless integration of AR characters with the real world is impressive. Needless to say, Jin Woo is sold. But because Se Joo is a no-show, he can't buy the rights to the program. Then he learns the rights to the game are tied to the deeds of the hostel. Buy the hostel, you buy the game. The person to talk? Se Joo's sister who, if you're still following, happens to be Hee Joo. He tries to get on her good side and offers her 10 billion won for the money pit she calls a hostel. He may not be her favorite person but the offer is too good to pass up so she agrees. Jin Woo keeps playing the game and realizes that his rival, Park Soon is also logged in as a player. They duke it out, hashing out their other issues as they clash swords. In the end, Jin Woo gains the upper hand and wins the battle. But there's a major glitch in the program that results in real world consequences, and things are about to take a turn for the worse. Now, Jin Woo has to find the missing Se Joo in order to fix the bug in the game and save his company from bankruptcy and more importantly, his life. The CEO of an investment company puts his money on an AR game that's so revolutionary it will change the world. But there's a glitch in the system that leads to the death of a former friend with him as the prime suspect. Not only that, his life is now in peril and his company is in danger of going bankrupt. He needs to find Se Joo, the young developer who's gone missing, to help him fix the bug and prove that he's not guilty of killing anyone. To do that, he has to embark on an in-game quest that's fraught with real-life danger. On top of all that, he's fallen for Hee Joo, Se Joo's sister, which further complicates matters. As he goes deeper and deeper into the game, he also falls deeper in love with Hee Joo. This is Hyun Bin's big K-drama comeback after three years working exclusively in movies. You may know him from the widely popular shows My Lovely Sam-Soon and Secret Garden. His last movie prior to signing on to Memories Of The Alhambra was the period action movie Rampant. If you're a K-drama fanatic, you probably know Shin Hye from Doctors, where she starred with Kim Rae Won, Pinocchio, playing an aspiring reporter and love interest to Lee Jong Suk, or in Heirs, alongside Korea's who's who of young stars: Lee Min Ho, Kim Wo Bin, Kim Ji Won, Park Hyung Sik, and Kang Ha Neul. Her last project was the crime drama movie Heart Blackened. The last time you saw EXO band member Chanyeol was probably in one of the band's music videos for the album Don't Mess Up My Tempo. He also guest starred in the reality show The Return Of Superman where he got to hang out with Korean soccer player Park Joo Ho's kids, Nae Eun and Gun Hoo. 1. Park Shin Hye, who plays the guitar in real life, still had to learn to play the classical guitar (which is different from your regular guitar, apparently), and took special care to master the piece "Memories Of The Alhambra." 2. Because her character was supposed to be fluent in Spanish, she learned to speak a bit of the language, too. 3. The screenplay was written by Song Jae Jung, the same writer for Nine, starring Lee Jin Wook and Jo Soon Hee, and W, starring Lee Jong Sook and Han Hyo Joo—two sci-fi thrillers that will also mess with your mind. 4. According to Soompi, Song Jae Jung based Hyun Bin's character on Elon Musk. 5. During a press con for the series, the director, Ahn Gil Ho, shared that he met with Chanyeol for the part of Jung Se Joo on Park Shin Hye's reccomendation. She was quick to counter the statement though, saying she had nothing to do with Chanyeol getting the part at all! 6. Having done action scenes before, Hyun Bin didn't have any trouble wielding a sword or shooting guns for the show, but acting like he was fighting with an imaginary weapon was another story. The challenge, he said, was making it look believable. The concept is novel and original—it's an Asian sci-fi thriller (which in and of itself is something new) that revolves around an augmented reality game. The special effects are state of the art and will blow your mind. In fact, they're so impressive you wish the game existed in real life and you could play it. And even if you're not a gamer, the show will have you hooked. Plus, they shot the hell out of Alhambra. It's so gorgeous you'll want to pack your bags and buy plane tickets to Spain right after you watch the first episode. It's the perfect setting, too, for the story they're trying to tell. Sadly, the story gets a little convoluted. Sometimes it feels like the writer lost track of the plot. I feel the show suffered the same problems W did. You keep watching, hoping that they'll eventually tie the loose ends or that the story will start to come together, but it just keeps on looping in on itself. As for the romance angle, it felt forced. Either the stars had no chemistry or the relationship between the two wasn't given enough time to grow and develop, so you don't ever quite believe that they fall in love. To be frank, the show should've just ditched the romantic subplot altogether. It didn't need it anyway. So how come I watched it all the way to the end? Because the story keeps propelling you forward. It's so gripping you can't help but keep going. I really wanted to see it all the way to the end and to find out how everything was going to be resolved. I also love the fact that it was different from anything I've seen before, especially on Asian television. It was bold in that way. I just wish the plot was leaner and tighter, and the ending more rewarding, though. K-drama fans who are looking for something fresh and new, or are ready to graduate from garden variety Korean rom-coms. Plus anyone who's into exciting sci-fi thrillers or are curious about Asian sci-fi TV. Finally, gaming nerds worldwide would definitely be into this show, too.